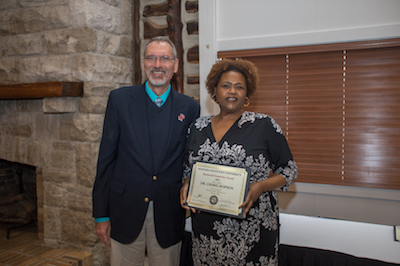 In spring of 2018, University College awarded Dr. Cheryl Hopson the Faculty Award for Research/Creativity within her department of Diversity and Community Studies. Chosen for outstanding contributions in her field, Dr. Hopson is a self-identifying poet scholar; she has written four published journal articles, a poetry collection entitled Fragile, and published 11 poems in various publications. Dr. Hopson’s writing specializes in generational black feminism. This includes mother daughter relationships, such as that of Alice Walker and her daughter Rebecca Walker. Dr. Hopson’s passion for writing and poetry began at the young age of ten and has been a personal form of expression. Her mother, an avid reader, introduced her to Alice Walker. “Really what I do is a continuation of what my mother began, just in her thinking process,” said Dr. Hopson. After learning that Alice Walker had a daughter who was also a famous writer, Dr. Hopson’s interest in the Walkers was, as she claims, “a natural progression.” She sees the stories that Alice and Rebecca Walker tell as stories that collectively tell the story of the two of them and black feminism. The Office of the Provost has twice supported Dr. Hopson to conduct research of the Alice Walker papers in the archives of Emory University. Dr. Hopson’s poetry collection, published in 2017, served as a way for her to come out of the grieving process of the loss of her two sisters. That collection took her two years to write. Her work also includes research on June Jordan, which resulted in a presentation at the Southern Kentucky Book Fest and a longer paper that she later presented and that will be developed into a longer piece to be put into a book on friendships between women. Through her passion of writing, Dr. Hopson hopes to make an impact on others. “What I hope for with my work is to open up dialogue between feminist generations, black and other, about the experience of being daughters, the experience of being mothers, and what it means to identify as a second generation, third generation, fourth generation feminist of color,” said Dr. Hopson. Her goals for the future include involving students in her work, encouraging them to present at various conferences all around Kentucky.